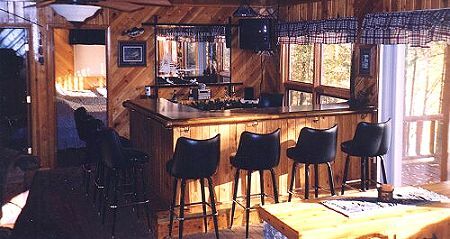 The cabin is a sportsman's paradise! Musky, walleye, and perch are the dominant species of fish. Whether it's the summer catch or ice fishing you're after, call and make your reservations for great fishing action today! Horsehead Lake is also a great hunting destination, with plentiful deer throughout the area. 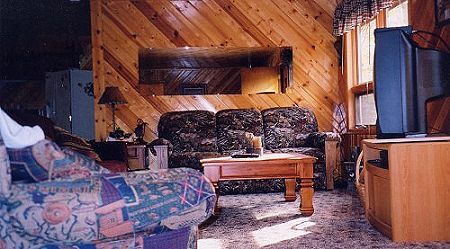 The cabin features an open-concept design: its comfortable living room, with 32" satellite TV and VCR, gives guests plenty of room for kicking back and relaxing. You'll find a complete kitchen with all the comforts of home, as well as a full wet bar with satellite TV that seats eight overlooking Horsehead Lake. The cabin features 2 spacious bedrooms both of which have 2 queen-sized beds and 27" satellite TVs. Make your reservation now, you will not be disappointed! Off season & nightly rates also available. Big Horsehead Lake in Vilas County near Boulder Junction Wisconsin.